We like happy endings, don’t we? We always want the underdog to win, and sometimes, we can get carried away with it – and hope the story ends the way it should. That’s easier. There’s no lingering dissonance to resolve. Pressing the pause button on his catechesis on the gifts of the Holy Spirit, Pope Francis reflected on Judas’ betrayal of Jesus for a sum, a price. It is often difficult to hear this in the readings of the mass, let alone see it in movies like the Passion of the Christ. It is difficult for us to see Jesus laying down his life in such a humiliating and degrading way. In his audience, Pope Francis insisted that we look at this easy exchange of 30 denarii for a life. We never get that happy ending, no matter how much we want it. Jesus’ Resurrection is not the happy ending of a beautiful fable, it is not the happy end of a film, but it is the intervention of God the Father when human hope is shattered. In the moment in which everything seems to be lost, in the moment of grief in which many persons feel the need to come down from the cross, it is the moment closest to the resurrection. The night becomes darker in fact before the morning begins, before the light begins. God intervenes in the darkest moment and resuscitates. Pope Francis provides us with the small task of kissing the crucifix this week, to submit ourselves, our circumstances, our sadness as well as our joy to the will of Our Lord, just as Jesus did in the Mount of Olives. “Father, if you are willing, remove this cup from me; yet, not my will but yours be done.”(Luke 22:42). It’s this submission of our lives, no matter what the circumstance, to God, that brings true joy. It is in this submission that God saves us. In seeking Him, we triumph over the darkness. Seeking Him, every day, through every circumstance, looking toward an eternity in heaven, is our happy ending. We must turn to God in our time of strife and bear our pain as He bore His. We can’t compare the tragedies we face with those others do. They have their trials and we have ours. The only thing that matters is that in such times, we ask for God’s help and reach out for His hand. He is our stronghold and will reach back. 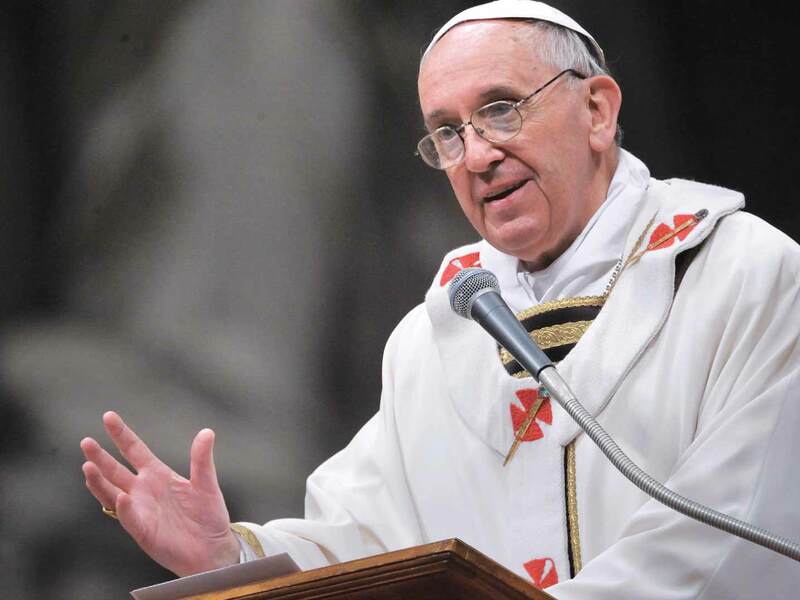 Read the full English translation of the Papal Audience here. See an excerpt of this week’s Papal Audience here. 1. )The City of God (Book I, Chapter 8) Of the Advantages and Disadvantages Which Often Indiscriminately Accrue to Good and Wicked Men. Revised and edited for New Advent by Kevin Knight. <http://www.newadvent.org/fathers/120101.htm>. 2.) Fiorelli, L. S. (1987). The Passion of Our Lord and What it Means. The sermons of St. Francis de Sales for Lent: given in the year 1622. Rockford, Illinois: Tan Books and Publishers.